The wait is finally over. OnePlus team has finally announced OnePlus 2 at an event today in San Francisco. Here are all the features, specs, release date, price and everything else that you need to know about the latest OnePlus 2 flagship smartphone. OnePlus 2 sports a refreshed design with a premium steel running on the sides. It features 5.5-inch full HD 1080p display and also comes with iPhone’s Touch ID-like fingerprint sensor at the front which can register up to five fingerprints. The camera on the back features 13-megapixels f/2.0 lens with laser focus and OIS which is capable of shooting videos in 4K resolution. The camera on the front is of 5-megapixels variety. There’s a dedicated hardware button called Alert Slider on the OnePlus 2 which can let you quickly switch between different notification settings. As far as CPU, GPU, RAM and internal storage is concerned, the device is powered by Snapdragon 810 processor with Adreno 430 GPU, 4GB of LPDDR4 RAM and a maximum of 64GB of internal storage. Battery capacity is measured at 3,300mAh. There’s also a USB Type-C port at the bottom and Dual-4G SIM card slots on the side. OnePlus 2 runs new OxygenOS 2.0 which is a custom variant of latest version of Android Lollipop. 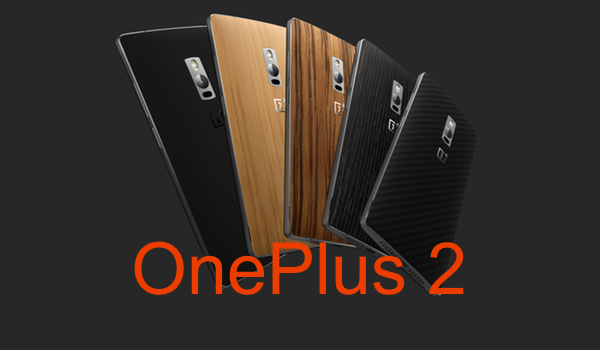 OnePlus 2 comes with classic Sandstone Black back cover, but you can easily swap it out with different options with what the company is calling StyleSwap Covers. These covers will be offered in: Bamboo, Black Apricot, Rosewood, and Kevlar. OnePlus 2 will go on sale in U.S., Canada, India, EU and China on August 11th, with a rollout planned in Southeast Asian countries in Q4 2015. You will still need an invite to get the phone. For more on how to sign up for OnePlus 2 invite, check out our earlier post here. OnePlus 2 is amazingly priced at just $329 USD for 16GB model and $389 USD for 64GB model.